Did you know Americans on average eat 100 acres of pizza a day, or 350 slices of pizza per second? 93 percent of Americans eat at least one pizza per month. 3 billion pizzas are sold in the U.S. each year and the annual pizza sales revenue is $40 billion dollars. Did you realize 4 out of 5 of the top pizza ordering days are right around the corner? The top five crazy-busy pizza days are Halloween, the night before Thanksgiving, New Year’s Eve, New Year’s Day and Super Bowl Sunday. This is a great time to make sure you are equipped to roll in the dough. The crust is a tell tale sign of a good pizza. 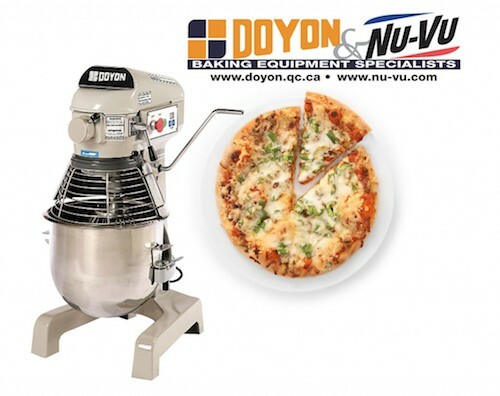 A great way to mix up the crust is with a Doyon Dough mixer. That is only if you’re looking to make the best pizza in town. Doyon mixers can keep up with the most demanding crowds with their cast iron frame and lead-free enamel coating. These mixers have everything you need including a stainless steel bowl; mixing hook, whip and flat beater; manual bowl lift and integrated ingredient chute. Extra features include auto shut-offs, separate controls and cool down features designed to protect the operator and the machine. Dough mixers have been a significant advancement in the production of pizzas. Keeping up with the high demand of quality pizzas requires having the right equipment in your prep department. Click here for Doyon’s video library, which includes mixer demonstrations.